I don’t remember much about my first experience of the seaside (the Lincolnshire coast, c 1959), except that I played a lot in the sand making sandcastles using a spade that was much too small (in my opinion my parents should have bought me the next size up). And one other thing. 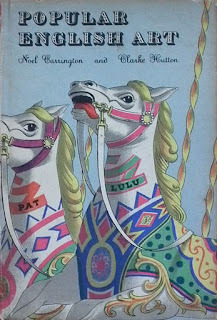 The gallopers. The carousel with horses and roosters that I was, to my great pleasure, allowed to ride. I already knew about roundabouts – from books I suppose. They were meant to have mirrors and fairground organ music and flashing coloured lights and garish paintwork and brightly caparisoned horses to ride on and roosters to ride on too and the horses and roosters went up and down as well as round and round and they had these twisted columns like pieces of barley sugar and every one had a name. Even then, having perhaps sensed that the Lincolnshire coast wasn’t exactly the last word in sophisticated holiday destinations, I thought the reality might be a let-down. The horses’ ears might be broken or the lights might not flash or it might be closed or there might not be roosters. Well, it wasn’t a let down. The lights flashed, the gallopers really galloped and there were even roosters. So these days, when I see a carousel, or even a picture of one like Clarke Hutton’s 1945 cover illustration for Popular English Art in the King Penguin series, I do experience a certain nostalgia and I’m thankful that the showmen of England still give me the chance for such feelings. 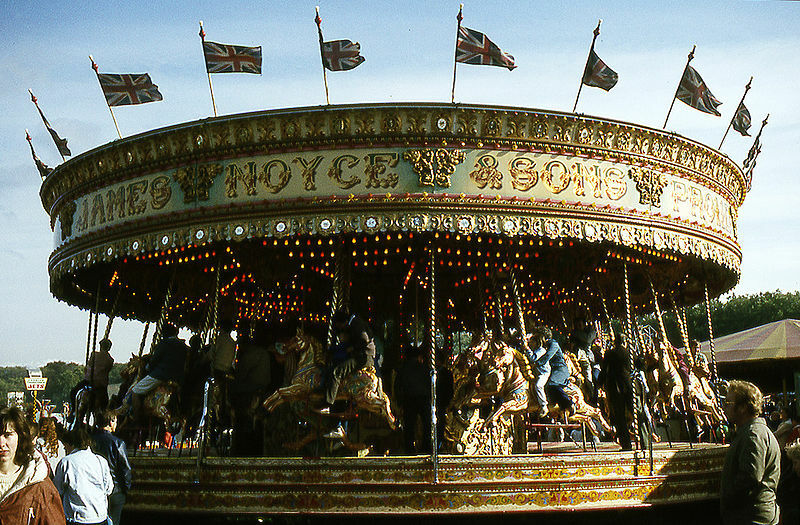 People such as the Noyce family, owners of the wonderful carousel in the photograph below. Dating from about 1895 and made by Savage’s of Kings Lynn, it was refitted in around 1900 with 30 horses and 6 roosters carved by Anderson of Bristol. In those days it was owned by one John Cole, from Yate, not far from the Bristol home of the horses, but it has been in the Noyce family since 1950. The photograph shows it at Nottingham’s renowned Goose Fair in the 1980s, but I think I remember it at St Giles’ Fair in Oxford a few years earlier too. 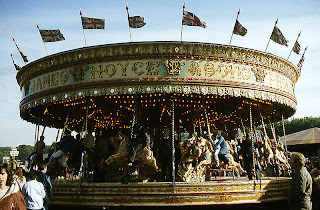 Though this ride has no doubt been repainted a few times since its first outing, its ornate lettering, bands of golden decoration and scrollwork, dazzlingly carved and mirrored centre drum, and of course magnificent horses certainly speak of the turn of the century period. It’s heartening to think it has been giving pleasure for well over a century. I hope it’s still doing so. It was a dollop of nostalgia, this post, and an attempt at sharing a childhood memory. 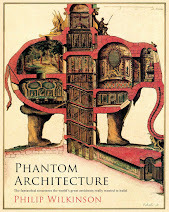 But it's something else too – it's architecture, reader, but not as we know it. It's part of the business of this blog to highlight, now and then, structures that are too humble, or too marginal, otherwise too different from the norm of four walls and a roof to merit consideration as architecture, or even as buildings. One definition of a building insists on its permanence: buildings are not, in general, meant to be movable, notwithstanding those epic North American house moves in which entire buildings are put on rollers or wheels and shifted bodily to a new site. So English Buildings has highlighted road-menders' trailers, a glittering Spiegeltent, and these gallopers, in the cause of bringing something different before readers' eyes. 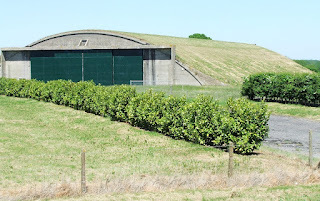 In this post last year I looked at an aircraft hangar at Hullavington and mused on my boyhood interest in airfields. As a small boy I was fascinated by airfields. Airfields (not airports, which in the 1950s and 1960s were for the rich to travel from, and therefore out of bounds) were quiet, empty places, mostly, and oddly spacious in a countryside that, even then, was quite intensively farmed. I longed to see aeroplanes taking off and landing, but hardly ever seemed to be there at the right moment. So I had to be content with the purposeful impedimenta of the airfield, most of it unfamiliar to me but not too difficult to understand from its names alone. There was a perimeter fence (chain-link), a control tower (concrete), runways (ditto), grey parked vehicles (various), and a windsock (brightly coloured). For much of the time the windsock seemed to be the most animated thing around. Also occasionally on the move was a long grey low-slung truck, a low-loader in fact, sometimes spotted on neighbouring roads, apparently for moving bits of aircraft around. And then there were hangars,† long and low, hugging the ground. Some even tried to blend into the ground with their grass-covered roofs. They had broad, sliding doors but these were usually closed and anyway were too distant for me to have seen what was inside. Still, when I see hangars, I’m fascinated by their tantalizing doors and their functional, often ground-hugging form. I’m still very ignorant of their history and complex typology – I see from a Ministry of Defence website that there are at least 56 different types in use in Britain alone, ranging from temporary portable structures to vast warehouse-like sheds that can take airliners or transport aircraft. 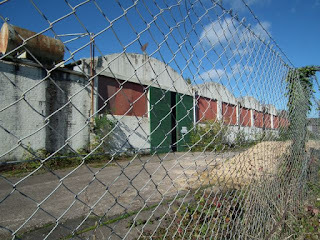 This one is a Type E hangar at RAF Hullavington in Wiltshire. Its design was introduced in 1937 – no doubt lots of hangars were being built around this time – and has a curving steel frame supporting a concrete shell roof, covered by the all-important camouflaging grass. It’s huge, and very functional, but also rather elegant, and from a distance it blends into its surroundings so that it seems hardly there at all. Whenever I pass by the door still seems to be closed. Looking back at this post, I'm struck by the many different reasons I might have found, even then, to be interested in places like this. Back in c. 1960, World War II was still recent history – it was usually referred to, without ambiguity, as 'the war', reruns of not-so-old war films appeared very often on TV, and war themes loomed large in playground games and parental memories alike. 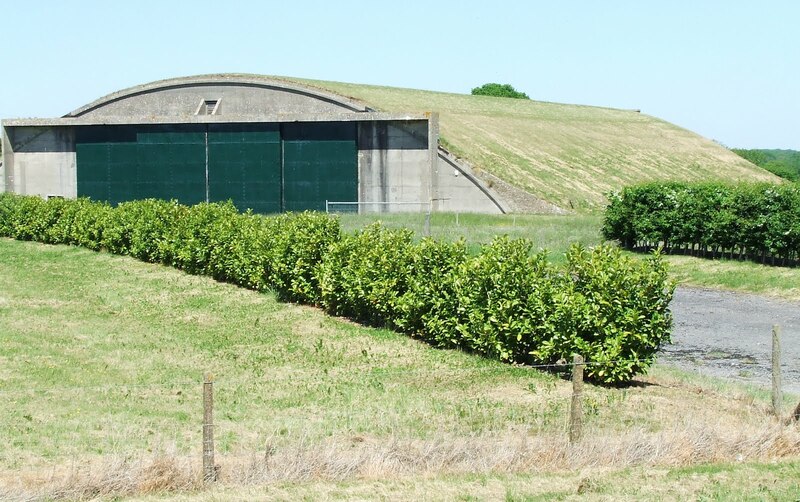 The first airfields I saw, in Lincolnshire, had played a key part in that war, and looking at them, even from the wrong side of the perimeter fence, gave me an insight into this history. I was also learning about the differences between places. The open spaces and distinctive buildings of airfields, so different from the small garden and tiny interiors of my childhood home, provided a dramatic demonstration of just how varied places could be – in the quality of their architecture, their use, their atmosphere, their sense of space. If this seems obvious, it's worth remembering the shock of the different that a five-year-old child, who'd not travelled very much, must have experienced. The fascination of what 's different, and local, and distinctive, has been holding my attention ever since. The collection of late Gothic windows along the south aisle of St George's, Brede, proclaims this part of the church to date to the 15th century, though the rest of the building is earlier. 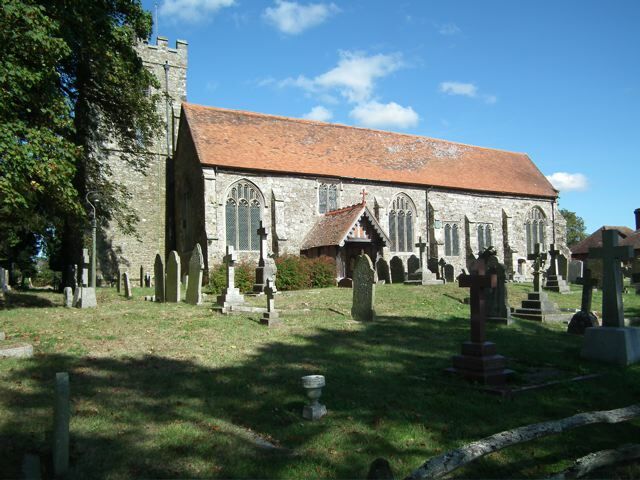 It seemed to me to be typical not only of its period but also of its place – the combination of grey stone walls and rich red tiled roof is redolent of Sussex. 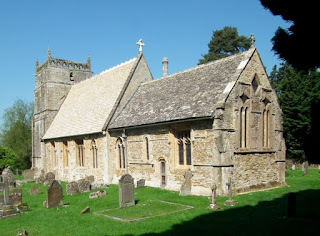 This happy marriage of building and setting is enhanced further by the fact that the church, set just off the main village street, overlooks a beautiful, broad valley, with views far into the distance. Having this place revealed to me – and by a friend who knows this part of the South Country well – was a great pleasure. I wanted to share this picture, with its associations of both architecture and place, because it sums up one of my main preoccupations. And a summing-up is appropriate because I want to signal a change, temporary I hope, in my postings. Regular readers will have noticed allusions in my posts to the Resident Wise Woman, who sometimes accompanies me on my trips of exploration, frequently shares her knowledge of history with me, and sometimes comments from the sidelines during her periods of non-residence – for her work, and indeed her predilections, regularly take her far away from the territory of English Buildings to the heart of the European mainland. It was on one of these trips recently that she was taken seriously ill. After an emergency operation and a stay in hospital, she is now steadily recovering in our half-restored farmhouse in the Czech Republic, and I am there helping her to get better and waiting on her hand and foot. With few new English buildings to share, and precious little time to write about them, I plan to reprise a few of my favourite earlier posts. I expect I will find it difficult to refrain from making additional comments on these recycled posts, but if these comments are sparse, or if my online appearances are less regular than usual, you know the reason. Here's to good health. Unassuming, isn't it? This utilitarian building, part of a very large industrial complex near the harbour in Lydney, is now at least partly empty. Walking past it on my way to look at the front of Naas House, something struck me about the way it is built, and I wanted to know more about it: above the plywood doors, those concrete walls, the imprint of their shuttering visible on the surface, seem like something out of the 1960s. Industrial Brutalism? They turn out to be earlier, an example of the ways in which the industrial and military architecture of World War II, simply by being utilitarian and hastily built, seems to anticipate what became high fashion later. 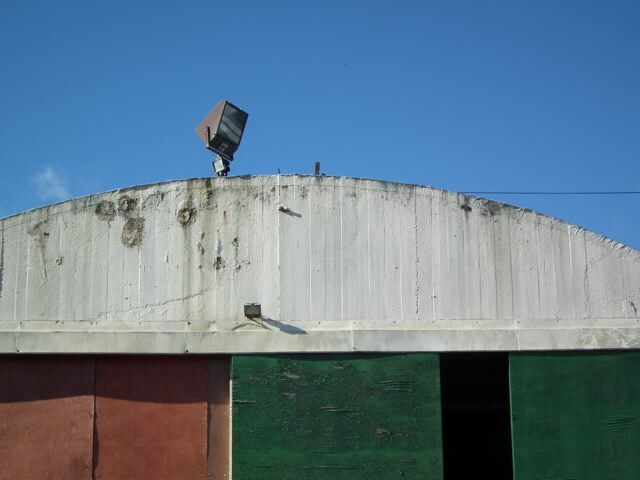 This building (I think: I've not found much information about it) is part of a factory, the Pine End Works, built in 1940 to make plywood for the fuselages of the Mosquito aircraft and for the Horsa gliders that were used in the D-Day landings. It was one of a host of factories built around the country, in places off the regular routes of the Luftwaffe bombers, to produce military aircraft (and later other hardware required during the war). These were facilities called "shadow factories" and they were built both to increase production and to guard against problems caused by the loss of existing facilities that might more easily be bombed. The staff, many of whom were women, were ordered to keep secret what they were producing and the outfit running this one, to maintain secrecy, was called simply and enigmatically Factories Direction Limited. The works was well sited to receive the large quantities of timber required, which came up the Severn from the Bristol port of Avonmouth – Lydney's harbour and canal are nearby. After the war the factory continued to produce plywood, but as far as I know has been empty for a while. It's bleak and unregarded now, but I'd like to think that with some care and attention, the vast spaces inside could again hum with the activity of people making things. Meanwhile, there it stands, to remind us that the least elegant of structures can have an interesting history. 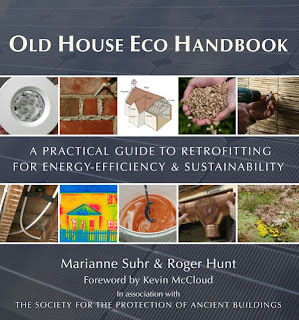 A while back, Marianne Suhr (who will be familiar to many British readers from BBC's series Restoration) and Roger Hunt co-wrote Old House Handbook, an excellent guide to maintaining and caring for old houses, from medieval to Edwardian. Now they've followed this up with a new volume, Old House Eco Handbook, which addresses the issue of caring for old houses while also making them sustainable. Like its predecessor, the new book is produced in association with the Society for the Protection of Ancient Buildings (SPAB). The book looks at many ways in which to make all kinds of old houses more energy efficient. As well as chapters on general principles and approaches, there are specific sections on roofs and ceilings, windows and doors, walls, floors, paints, and energy and water. The authors start from principles laid down by SPAB, and point out that often these are likely to be "green" anyway – for example, SPAB encourages owners to repair rather than replace, and repairing is likely to use fewer natural resources than wholesale replacement. 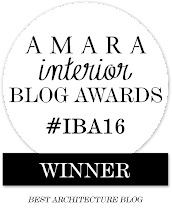 The authors stress the value of a holistic approach, balancing the benefits of energy-efficient technology with the impact on aesthetics. They embrace reuse and recycling too, while also warning readers to treat architectural salvage with appropriate caution by verifying the provenance of salvaged items. Old House Eco Handbook is full of useful advice – about using lime, about waste reduction, about selecting types of paint, about minimizing water usage, and so on and on. 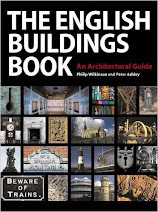 It contains a lot of information on materials that will be new to many readers – anyone for reed board or insulating lime plasters? It is replete with warnings about approaches that might work on modern houses but are far from ideal in older ones. Again and again, the authors point out that the standard modern approaches to keeping a house warm by hermetically sealing it from the elements simply don't work on older buildings, which have to "breathe" so that moisture is allowed to escape through the fabric of the walls, rather than being trapped inside them. The books is pragmatic, though. The authors realise that the kind of insulation that works for an old house might not be as efficient as a more modern material. But they show ways of making some improvement in energy efficiency, without compromising the needs of aesthetics or conservation. Their practical solutions have been arrived at through hands-on experience too. And if you don't feel confident to do the jobs they describe for yourself, it still makes sense to get hold of this book so that you can understand the options and talk to contractors and craftworkers from an informed standpoint. Old House Eco Handbook is attractive, absorbing, and packed with information. I'm still learning from it. SPECIAL OFFER The good news: Frances Lincoln, the publishers of Old House Eco Handbook, are making a special offer to UK readers of this blog. 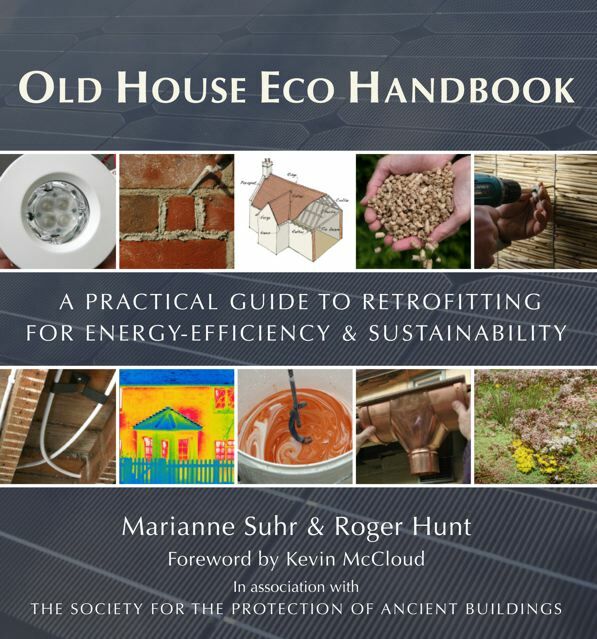 To order Old House Eco Handbook at the special offer price of £24.00 inc UK p&p (RRP: £30.00), please call Bookpoint on 01235 400 400 and quote the code 46OHEH. Encouraged by the lengthening evenings and a really warm, sunny day, I head off for a short walk before sundown. I remember a similar walk some years ago, when the Resident Wise Woman pointed us in the direction of some earthworks that are all that remain of the medieval village of Pinnock, high in the Cotswold sheep country. Leaving the car at a wide place in the road, I walk along the tarmac until I come to a gap in the hedge and find this sunken lane leading downhill towards the earthworks. 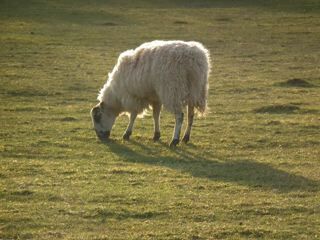 Here in the country, it's noisy, as usual, but the noises are appropriately rural: larks singing as they rise from a nearby field; the occasional pheasant erupting with a noise of flapping wings and clanking call; the ceaseless baaing of sheep and lambs. Sunken tracks like this are not unusual. One theory of their formation is that they mark the ancient edge of two landholdings, and that each landowner marked the boundary by an earth bank. Digging the earth to make the banks left a dip in the middle which formed an access track, and, as rainwater flowed down the slope, more soil eroded away and the track became still deeper. Hedges and trees on either side grow until they almost cover the path. Their roots and the stony ground make the way uneven and hard on the feet. As I come to the lumps and bumps that mark the site of the deserted village I realise that, of course, the light is quite wrong to photograph them. To catch their shadows in the grass I need to point my lens right into the low evening sun. The whole site would naturally be clearer if I could get above it in an aircraft. So as the light begins to fail, I climb back up the sunken lane, thankful at least for the rural tranquility and the glimpse of this atmospheric and ancient route between the trees. 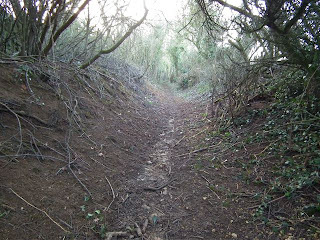 Just after writing this, I discovered that Robert Macfarlane, superlative chronicler and analyst of all things to do with places and our routes into and through and across them, is about to publish Holloway, about his journeys along sunken lanes in Dorset with late and great Roger Deakin and Macfarlane's subsequent visits to the same places after Deakin's death. I'm sure that Rogue Male, Geoffrey Household's novel in which the hero hides in a Dorset holloway, will loom large in Macfarlane's book. It was also on my mind as I made my own walk, as was another, less well known, novel by Household, Watcher in the Shadows, which comes to its compelling climax in Gloucestershire, a few miles from where I was walking. 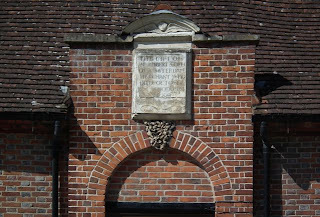 And I'm directed to the Stiles Almshouses: solid, brick, unpretentious, and with a weathered stone plaque telling me that they were built by an Amsterdam merchant,† of all people, in 1680, which makes them the earliest datable brick building in this admirably brickish town. I thank my companion, but he encourages me to look further, to push open the door, and cast my eyes down. And what I see takes my breath away: a floor made partly of sheep's knucklebones, a serviceable if knobbly substitute for stone cobbles no doubt contemporary with the rest of the building. A similar floor was found last year by archaeologists excavating the site of the Curtain, the London theatre that hosted Shakespeare's company before they decamped to the more famous Globe. 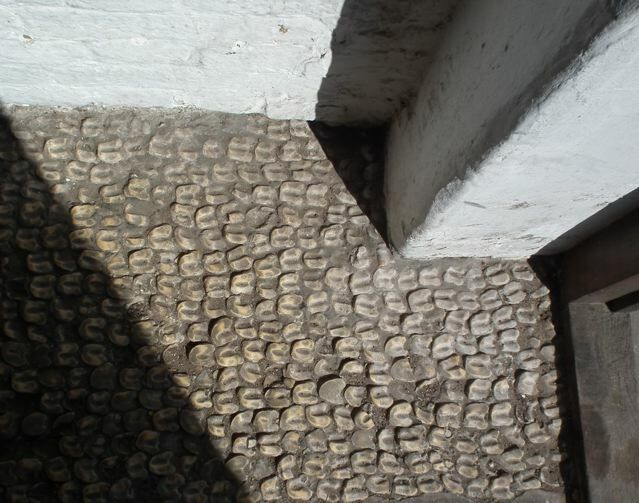 In those days they knew how to knuckle down and cobble together a hard-wearing floor. *Wantage is now in Oxfordshire, but I use the traditional English counties because they reflect the usage in Pevsner's invaluable Buildings of England books – and because I like them. 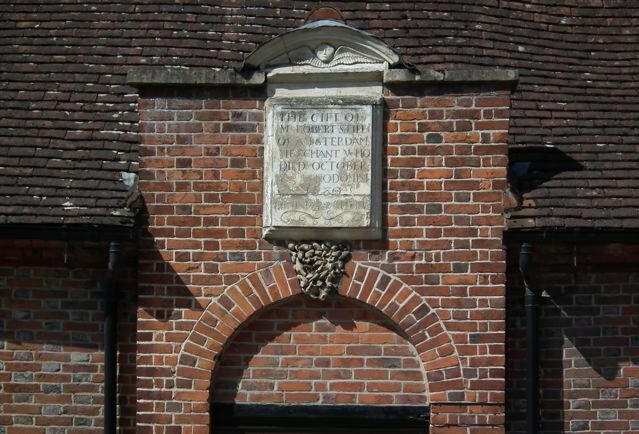 †There's more about the founder of the Almshouses and the plaque above the door in the Comments section – click on the word COMMENTS below. Talk about purposeful. If ever there was one, this is a building that knows what it's about. Blue bricks as hard and solid as when they were laid in the 19th century. Pointed windows and doorways with arches so slightly curved as to be almost straight – no messing about with the Gothic revival here. Quoins and dressings in a pale brick that looks as hard and forbidding as the blue. Drain pipes rising right next to the front door. Solid little crenellations around the flanking wall. Iron-studded front door that looks as if it would take a battering. 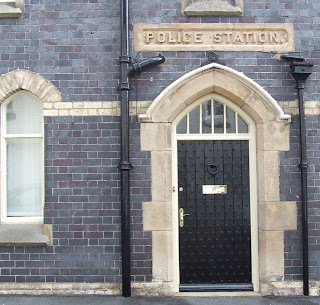 All of this makes it unsurprising that this embodiment of solidity and security is a police station. Oddly enough the name stone above the doorway has some slightly ornamental touches – mixed in with some very plain letters (E and I) are a couple of rather fancy ones (A and O). One can almost see the carver starting to give way to ornament before relenting and signing off with a very plain N and the usual Victorian full point. Soft? Not on your life.